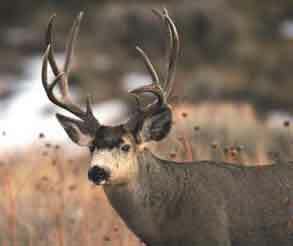 SANTA FE -- Hunters who want to participate in New Mexico's 2007-2008 public-land deer, elk, antelope, ibex, javelina and bighorn sheep seasons have until midnight April 7 to apply for licenses and permits in the state drawing system. Applicants also are reminded that harvest reports for the 2006-2007 deer, elk and furbearer seasons -- along with an $8 late fee if applicable -- must be received by the Department before they apply or their applications will be rejected. The 2007 deer season will be the third in which hunters must enter a public drawing to be eligible to hunt on public lands statewide, or on private lands in Game Management Units 2A, 2B, 2C, 4 and 5A. Deer hunters who do not apply or are unsuccessful in the drawing will be able to hunt only on private land -- with a valid permit, license and written permission of the landowner. Applications submitted via the Department of Game and Fish website, www.wildlife.state.nm.us , must be received by midnight, MDT, April 7. Applicants who use the website are encouraged not to wait until the last minute to avoid delays due to the high volume of website users. Hunters also can use paper applications, which may be obtained at any of more than 200 license vendors statewide and at Game Department offices in Santa Fe , Albuquerque , Raton, Las Cruces and Roswell . All paper applications must be either hand-delivered to the Santa Fe office by 5 p.m. Friday, April 6, or postmarked by midnight MDT Saturday, April 7. Mandatory harvest reports were due Feb. 15 from all hunters who held 2006-2007 deer or elk licenses, and are due March 31 for all furbearer hunters and trappers. Hunters and trappers who did not report by the deadlines can still participate in the 2007-2008 hunt drawings if they complete their harvest survey and pay an $8 late fee before applying for a 2007-2008 permit or license. Hunters who fail to report their 2006-2007 harvest results -- successful or not -- will have their 2007-2008 applications rejected. Initial reports indicate 81 percent of last year's deer and elk hunters reported their harvest results by the Feb. 15 deadline. Drawing results will be available in late June on the Department website, or in person at any Department office. More information about big-game hunting in New Mexico can be found in the Big Game Rules and Information booklet, available at license vendors, Department offices, website, or by calling (505) 476-8000. SANTA FE -- Almost 16,000 New Mexico big-game hunters used the Department of Game and Fish online application system to apply for oryx, bear, turkey and population-reduction hunts this year, an all-time high since the online system was first offered in 2004. Eighty-seven percent of the nearly 18,000 applications were completed online, and 2,322 applicants chose to use paper forms. In all, 3,209 applicants were successful in the first of two drawings for 2007-2008 big-game hunts. The application deadline is April 7 for the next drawing -- for deer, elk, antelope, ibex, javelina and bighorn sheep. Hunters who use the online application process pay a $6 fee with a credit card at the time of application, and are charged for the license only if they are successful in the drawing. Hunters who use paper applications must pay the entire license fee with their application, and will receive a refund check if they are not successful. "Most hunters consider the online process more convenient, and they don't have to wait for a refund if they are unsuccessful," Department Assistant Director Patrick Block said. "It also gives hunters the option of changing their applications before the drawings, and it saves the state time and money because we don't have to issue refund checks." There were 1,300 rejected applications in the first drawing. Of those, 269 were from hunters who failed to report their harvest results from the 2006-2007 season before applying. Beginning this year, everyone who held a license to hunt deer or elk, or hunt or trap furbearers, must report their harvest results whether or not they were successful. More details on the mandatory harvest reporting requirements can be found on the Department website, www.wildlife.state.nm.us . 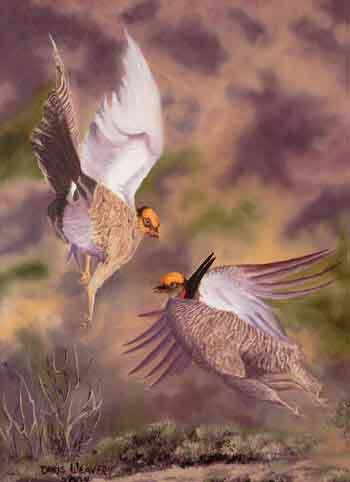 SANTA FE -- Glenwood artist Doris Weaver's oil-on-canvas painting of two lesser prairie chickens sparring on their mating lek was chosen as the winner of the 2007 High Plains Lesser Prairie Chicken Festival poster contest. Weaver will receive the $300 first prize and her work will be reproduced as the annual poster for the festival, which will be April 13-15 in Milnesand , N.M.
Mariah Ibuado, an 11-year-old fifth-grader from Daniel Fernandez Intermediate School in Los Lunas, won the category for grades K-6 with her drawing of a prairie chicken in flight. She will receive $50. The High Plains Lesser Prairie Chicken Festival celebrates the bird and the Llano Estacado (staked plains) of eastern New Mexico . Participants see prairie chickens perform their remarkable early morning courtship dances, learn about the area's cultural and natural history, take daily birding tours, and enjoy good food and western hospitality. This year's guest speaker will be Pete Dunne, considered to be one of the nation's top birding experts. Dunne is the author of seven books, including Pete Dunne on Bird Watching, Hawks in Flight and The Art of Pishing. Called the "Bard of Birding" by the Wall Street Journal, he is vice president of the New Jersey Audubon Society and director of its Cape May Bird Observatory. Reservations still may be available for the festival, which is limited to 100 participants to avoid disturbing the birds during the sensitive breeding season. Registration is $90 per person, which includes all field trips, five meals and a poster. To register or for more information, please call Tish McDaniel, (505) 762-6997. SANTA FE -- Almost 800 students in more than 40 New Mexico communities were certified as knowing how to hunt safely, ethically and responsibly March 10-11 during the state's first Hunter Education Weekend. "Now it is up to these new hunters to demand the same from anyone they hunt with," said Mark Birkhauser, Hunter Education Coordinator for the Department of Game and Fish. He noted that in one weekend, instructors certified almost one-fourth the number of students certified during all of last year. Hunter Education Weekend was a push by the Department and many of the more than 500 volunteer instructors statewide to certify as many students as possible before the April 7 application deadline for deer, elk, antelope and other big-game hunts. In New Mexico , hunters under age 18 must meet the hunter education requirements to be eligible for the drawings or to buy any type of firearm hunting license. Youngsters who need certification and missed Hunter Education Weekend may have to wait until next season, however, because all classes in New Mexico before April 7 are full. To find a class in your area, please visit the Department website, www.wildlife.state.nm.us , the International Hunter Education Association website, www.huntcourse.net , or call (505) 222-4731. New Mexico 's Hunter Education Program has certified more than 156,000 students since the training was first required in 1976. The course focuses on firearms safety, but has changed considerably over the years, with the additions of instruction about bow hunting, survival, game care, wildlife identification and hunter responsibility.